It’s been a week since the news that 11 out of the 12 footballs the Patriots used in their game against the Indianapolis Colts were reported to be under inflated. The New England Patriots’ footballs were allegedly filled to 10.5 PSI — two pounds below the league minimum. An uproar ensued and America demanded football justice. Bill Belichik and Tom Brady were seen awkwardly answering questions in front of a media that were firing off probing questions as if they were interviewing Obama after he announced that America was planning to invade Canada for their maple syrup. Now the Patriots legacy is under question, and the evidence seems to suggest the Patriots are a bunch of freaking cheaters. Enter Tom Brady. He’s a quarterback that was benched at Michigan. He was a player who showed up at the NFL combine who looked like he was actually about to be examined for scoliosis. He is an athlete who no one ever thought would be successful. He was a sixth round draft pick. Now, he is on his way to be the greatest quarterback of all time. He renegotiated his contract to give his team a discount in an era where free agents try to acquire the most money. He never quits. Every year, he leads a team with people like Julian Edelman, Alan Branch, Jermaine Wiggins, Shane Vereen, James Develin — football players who played different positions in college or couldn’t find a spot on any other team. He leads a team of people who were unwanted, undesired…cast off. And they play like a team. They preach team first. They are Massachusetts. I consider myself an underdog. In high school, I couldn’t even spell, and I had no idea what a comma splice was. I received a D minus my freshmen year in English; I was told that being a writer is like trying to find a way to travel to the moon with a go-kart; and I’m trying to prove everyone wrong. I have a chip on my shoulder. I’m hungry, angry. 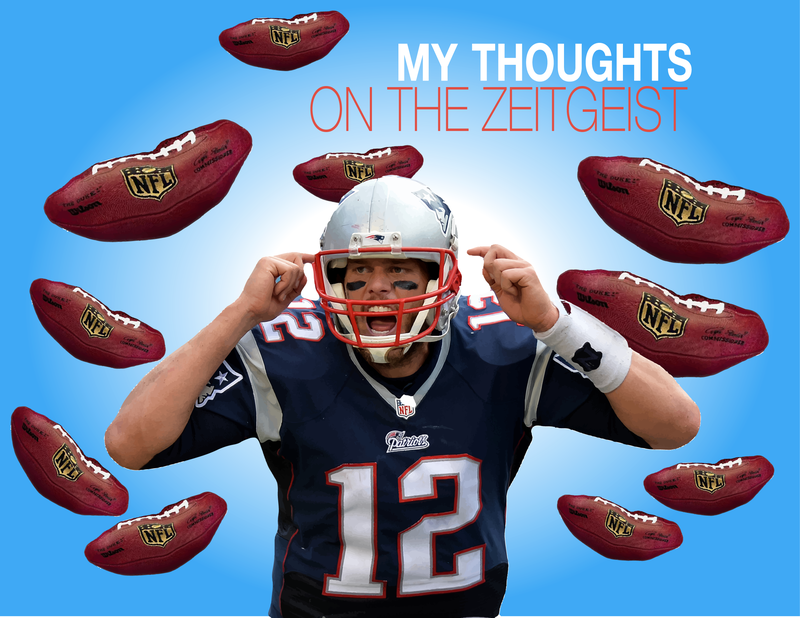 So how do you think I took the news of deflategate? It’s a bit suspicious though that Bill Nye is a Seahawks fan. There are so many questions surrounding deflategate (Did the hoodie give the order? Did Brady instruct one of his ball boys to deflate the balls? Didn’t Brady look like he was hiding something in his press conference?) that led anyone with common sense to think that the Patriots are, in fact, a bunch of cheaters. The way that the evidence stands, right now, seems to me that someone in my beloved organization is cheating. 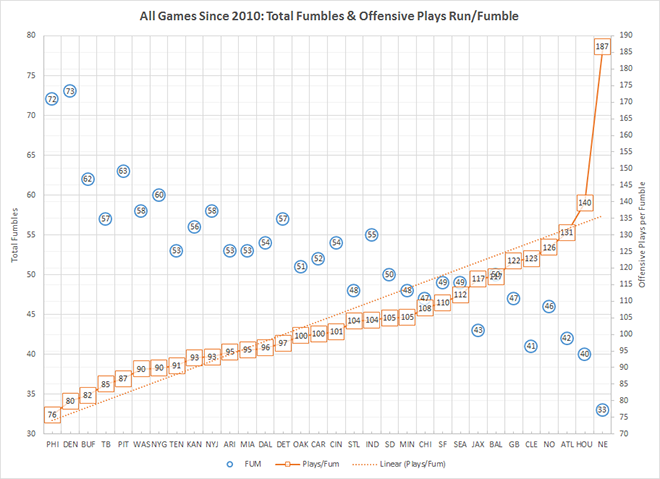 As you can see in the graph, the Patriots had far more offensive plays per fumble than the second best team in the NFL. It’s almost not even comparable. How could they be that much better at ball security. Granted, the hoodie does preach and practice ball security in innovated ways, and he even had a runner, BenJarvus Green-Ellis, who went an entire year without a fumble. While this seems like a great stat, someone actually looked at his fumbles with the Patriots compared to his fumbles with his next team, the Bengals. From 2008 to 2011, Green-Ellis didn’t have a fumble once with the Patriots. In two seasons with the Bengals, he fumbled a total of five times. When I look at whether or not the Patriots are guilty, I see a lot of data that suggests that they are, but it’s still not proven. On the way home today, I heard Boomer Esiason on the radio talking about the Patriots and whether or not they were cheaters. He made an excellent point. In the game against the Colts, Tom Brady under threw Shan Vereen by about five yards. He threw an under thrown interception, where he had Gronk open over the middle. He wasn’t performing well, so if he did deflate the ball the technique wasn’t working. Also, why would Belichik call a second press conference and emphatically state that there was no wrong doing from the Patriots after his first press conference. He knows his legacy is on the line, and he knows that people are suspicious: would he really double down on his teams’ innocence, publicly and emphatically, if we was still cheating? Think about Barry Bonds: he ducked the media on the steroid question. The answer could be yes, but we don’t really know. I read another theory from the Boston Globe that was intriguing. Chuck Pagano was the defensive coordinator of the Baltimore Ravens with John Harbaugh, who was pissed that the Patriots used “trick” plays with ineligible receivers in the divisional championship round. People are starting to get suspicious of a revenge plot from Harbaugh. What I’m reading is that perhaps Pagano and Harbaugh were scheming together to make it look like the Patriots were deflating their balls. Yes I know that I’m making some paranoid, Homeland type conspiracy theories here, but Harbaugh is pissed. Could it be possible that the Colts inflated their balls outside in the cold temperature, knowing that the balls would lose air if the balls were inflated inside, in order to make it seem like the Patriots were cheating? Could the Patriots actually be innocent? Well, in the words of the great Boston Celtic Kevin Garnett, anything is possible…Let’s go Patriots! Your comments are always appreciated. Hopefully we can start talking about the game this week.